My 2-way satellite speakers seen here from the front and back were built in the summer and fall of 1994. Due to a number of extended business trips, they were built in stages as time permitted. The original intent was to tune the crossover myself, starting with a basic, textbook, formula driven circuit. But as my travels came to an end, all I wanted to do was sit back, relax and enjoy them. And so the original textbook crossover remained in place for about a year. 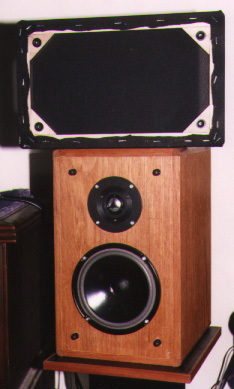 In late 1995, I took some time and measured these speakers with a Radio Shack SPL meter. The resulting numbers confirmed the audible rising high end that I found annoying. It also showed a 5dB dip at 4 KHz which I did not hear. I decided to ignore the dip which happens to be close to the intended crossover frequency of 4500 Hz and was thus most likely a crossover bug. 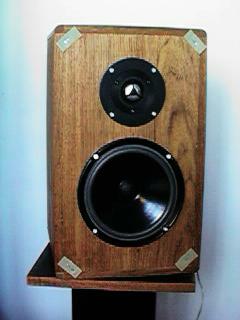 As for the rising high end, I eventually did minimal work by placing a 4 ohm resistor in series with tweeter. The resulting sound was much more to my liking and they remain in this state to this day. The imaging is quite good, and when used with my NHT 1259 based subwoofer they sound super, IMHO. NOTE - It's important to emphasize that this design is far from perfect. It represents what happens when a novice tries to built speakers from scratch with few tools and relatively little knowledge beyond the fundamentals. The lessons learned are as much on the how-to as on the how-not-to. But perhaps most important of all, the overall satisfaction of creating something that, in my humble and admitedly biased opinion sounds far better then most mass-market speakers makes the project worth the time I invested. For simplicity, I went with a sealed box design. The woofer used is an ACI AC7. This is a 6.5 inch, 8 ohm treated paper woofer with a foam surround. A nearly identical woofer is Vifa's C17WG-08. In a small sealed enclosure of a bit under 0.6 cubic feet, the calculated F3 is 61 Hz. Actual measurement confirmed a final F3 in the 60's. In use, the satellite and subwoofer are driven via an active crossover set at 100 Hz so the satellite's low end response is not very crucial. The tweeter used is a Vifa D25AG-05-06. This is a 6 ohm, aluminum alloy dome tweeter. The Vifa D25AG-35-06 is similar but has a lower Fs (1500 Hz versus 850 Hz). Since I used a relatively high crossover frequency of 4500 Hz, this was not an issue. The tweeter's high end response is well over 20 KHz. As mentioned earlier, the crossover is nothing to be proud of; yet the results are quite pleasing to my ears. The circuit is a 4th order Linkwitz-Riley design consisting of two inductors and two capacitors in each of the tweeter and woofer networks. The tweeter network also has an series 4 ohm resistor as mentioned earlier. 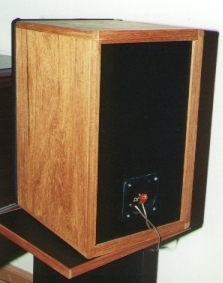 Component values for the chosen crossover value of 4500 Hz can be derived from cookbook formulas such as those in the Loudspeaker Design Cookbook by Vance Dickason. The Radio Shack SPL meter I used to measure the speaker's SPL is spec'ed at 32 Hz to 10 KHz +/- 3 dB. 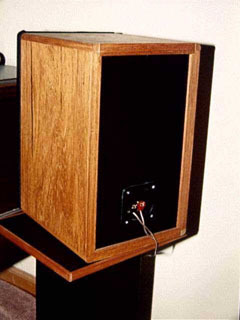 Using a Stereophile test CD, the speaker's response is 90 dB +/- 3 dB from 80Hz to 10 KHz with a 2.83V input measured on-axis at 1 meter, except for a room (floor) notch in the vicinity of 160 to 200 Hz where it is down 6 dB. The previously mentioned dip at 4 KHz actually falls within the +/- 3 dB error range. In the narrower range from 400 Hz to 10 KHz, the response is much flatter at 92 dB +/- 1.5 dB with the exception of the notch at 4 KHz. Below 80 Hz, the response drops another 0.5 dB at 63Hz before falling off at roughly 12 dB per octave as expected. All-in-all, the response is quite respectable, especially when one considers that these are in-room measurement. 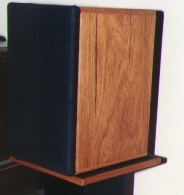 The enclosure is made of 3/4 inch MDF and is veneered with rosewood on five sides. The back is painted flat black. The external dimensions (in inches) are roughly 9.75 wide by 15.625 tall by 10.75 deep. Each panel of the box was veneered separately after first dry-fitting all the pieces. The two panels that make up the left and right sides are rabbetted on the top and bottom so that the top and bottom pieces sit partially in the rabbet. This leaves a missing square that is filled in with a piece of solid cherry which is then rounded over. Hopefully, this picture will show what I mean. Notice the solid cherry piece on the four corners of the enclosure. The reasons for using the solid cherry are (1) to provide an easy surface to round over the edges and (2) to prevent exposed end grain on the veneer which could be easily damaged. The back MDF panel is rabbetted into all four sides (left, right, top, bottom) and recessed 1/4 inch. It is finished with black spray enamel paint plus a clear topcoat. The terminal cup is mounted with four screws and caulked from the inside to seal the opening as tightly as possible. The front looks like this without the grill on. The baffle is rabbetted into the four sides and sits flush with them. The four whitish rectangular objects at the corners are velcro pads I stappled into the MDF to hold the grill. They work surprisingly well, though it lacks that finished look ! I forgot to recess the drivers during construction so that they could be flush mounted, so I ended up just surface mounting them. This meant that the grill had to allow driver clearance. The grill is just a piece of MDF with a center rectangle removed. Acoustical fabric is then stretched over the unit and stappled on the back side. Finally the corresponding velcro pads are stappled in place. All exterior veneer surfaces are finished with Danish oil and wax. The crossover is build on a small board and screwed to the back of the enclosure on the inside. Internal bracing consists of just some reinforcement along the top and bottom inside edges where the cherry is. These were the weakest points in the original box. No other bracing was added as the box is fairly small. The result is a very strong, stiff and heavy box. I like to make things. I also like to learn from my projects. This speaker was no exception. I made several mistakes such as the mouting of the crossover which made it difficult to tweak later (this inspired the crossover mounting in my aforementioned 3-way speaker which I built later). I forgot to mount the drivers flush; did not account for the grill's attachment to the baffle (hence the velcro); and did not pay as much attention to the crossover as I should have. I learned to apply veneer with a household iron; realize nuances in the music I listen to which I had previously missed (due to really poor speakers) and decided to better plan future projects so that I give them the attention they need. I also believe that I lucked out on the crossover and that it could have come out much worse. But on the plus side, this project enticed me to once again enjoy listening to music. As of this writing, I am in the process of completing some new speakers and have thus taken the time to update this pair. I particularly disliked the existing velcro grill; they were surprisingly difficult to remove and failed the "completeness" test. I decided to retrofit the grill with traditional socket grill connectors from Madisound. This involved gluing triangular MDF corners to the grill to provide enough surface area to hold the sockets. The balls are mounted to the baffle. Whereas the grill fabric was previously stappled in place, this time, I added hot glue. Here is the retrofitted grill and speaker.